I was talking to my pal, client and Pittsburger, Lynne about Isleys, chipped ham (to some chipped chop ham), a "ham barbeque" (chip chop ham in sweet Kraft's barbeque sauce, or a combo of catsup, sugar and vinegar), and of course, Lemon Blennd. Isleys was also the home and creators of the famed Klondike, which is now available nationally--but lived in all of our refrigerators growing up. We didn't go as far as the George Aiken's discussion (and their terrible, smelly chicken)--but it was hovering around the edges. 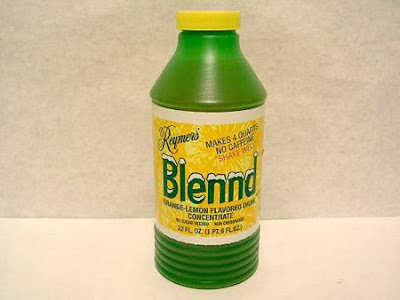 Turns out, the Pittsburgh Macaroni Company (from the Strip, otherwise referred to by my mother and husband as "The Bent Can") has a website that you can buy Lemon Blennd from which i plan to today. Blennd is great in iced tea...but by itself it has a certain CitraShine lemon quality combined with a cloying sweetness that is unforgetable. Notice, I did not say delicious...but it is memorable and a good add. K brought home a report card with some good grades and bad grades in classes she should excel at..but "forgot" to turn papers in. Did you hear the airhorn (me) blow the roof off the house? I am confounded. A did well in the track meet. He runs well and looks comfortable doing it...and the group on M School kids are a happy, chatty bunch. So, its fun to watch the sidelines as well as the sports. House of Health was excellent. The inclines are increasing, the pace picking up...and I am beginning to understand what to do when I get bored. Lots of huffers and puffers today. Ran into some lovely local Tburg ladies, celebrities I am a bit hesitant to name...We had a nice jawbone in the locker room with some interesting tidbits falling about fashion, branding, local real estate and the old time music scene. It was great to see them...lots of active brains ticking with those two. Saturday is coming up. Pasta and pesto for 50. Hello Wegmans. Bread too. And, some cut fruit? Petit Fours to be picked up on friday. Too much. We will need plates and napkins, piniatas, frisbees and of course the sound system. Perhaps projecting the Ballywood version of Pride and Prejudice. Seems like fun to me. Am hitting a creative wall for a second. Need to change horses.